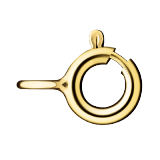 This golden spring ring is designed for use in jewelry products like bracelets and necklaces. The precise production procedure ensures long durability. Other jewelry findings are also available.